We are so excited to be joining WOW toys for there #WOWToysAdvent this year. We shall be doing a countdown to Christmas with them by using there fun Christmas Advent calendars. Keep a eye on on my Twitter Page to see daily advent tweets. The WOW toys advent calendars are the perfect way for your child to count down to Christmas. 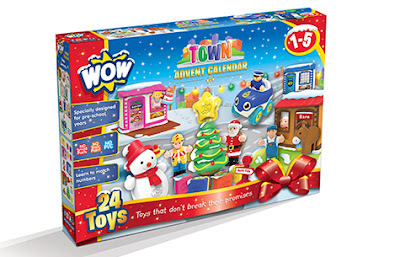 WOW Toys have 3 different calendars all with a Christmas theme and is filled with toys. Behind each door is a new toy and by Christmas day your child will have a whole new set. The 3 calendars that are available are Farm, Town and Wonderland. All sets come with 24 pieces, a car and a mixture of characters, animals and Christmas themed toys. All WOW Toys are made with PVC Free and Non Toxic Paint. 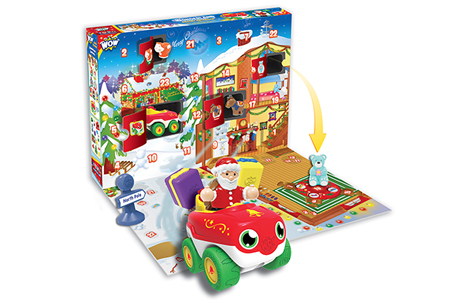 The calendars fold down to create a scene and when you open each door, the toy you get will match with a number on the scene. I hope that you will join us for the WOW Toys Christmas Countdown and if you decide to, then please post any pictures you take with #WOWToysAdvent. How would you like to win one of these? WOW Toys has one to give away to a lucky winner. Enter on the Gleam app below. the winter wonderland looks great, my little grand daughter would love it, fab giveaway thank you and fingers crossed for me and good luck everybody. 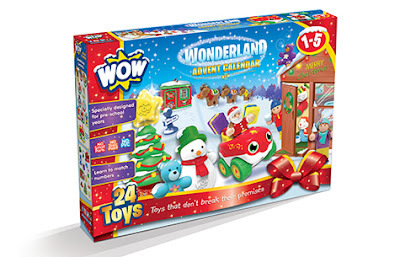 I love the look of the Wonderland Advent calendar because it looks and sounds so Christmassy! I love the winter wonderland one, it has such a Christmas feel to it. The farm one would be fab for my animal obsessed boy. Winter Wonderland as has a Christmassy vibe! I think my Daughter would love the Farm the best. I love the Winter Wonderland one, I love Christmassy advent calendars. The Wonderland as I think my son would love the Christmas feel to it, building up to the big day. I love the farmyard set so cute and great for all year round play @bexallum on twitter. Wonderland, YAY! It is nearly Christmas, just what you need to start your celebrations! What a great product! I've never seen these types of Advent Calendars before! My son would love the Farmyard calendar as he loves farm animals! I'd choose the Wonderland Advent calendar because it I think it's the one my little girl would love the most. Wonderland because it's that extra bit Christmassy! The Winter Wonderland one because it looks Christmassy. the farmyard calendar, because my little man Is just not getting into playing with animals. I love the look of the Wonderland advent, With it being christmasy I think it is lovely for the little ones to open each morning! My daughter would love it, super idea! The winter wonderland would be one that my girls would enjoy. These all look amazing! But I think I'd choose the Wonderland one as it's something a little different. I liked Wonderland, purely because it looks and sounds more Christmassy. The Farmyard is my favourite, maybe because I live in the countryside. My daughter loves animals so I would choose the farm one. I think my girls would love any but the wonderland just seems so perfect for the build up to Christmas. Would like the Farmyard one as my son loves animals. the winter wonderland looks great for my niece, i guess its more christmassy! The farmyard one, my son loves anything associated with farms at the moment. the farm, emma loves animals! I like the farm one because my little boy is crazy about anything to do with farms. I love Wonderland but think my little grandson would like the Farmyard calendar the best. He loves all the farm animals. Will choose Wonderland. Love the magic of Christmas and this one looks perfect. Probably the Farm one for my Granddaughter. She has some flash cards & every time we come to a farm animal she makes the appropriate noise, so I think she would have a lot of fun with that one. I love the look of the Town advent calendar! I think my little boy would love it! He really loves cars! The Wonderland would be perfect. Nice and Christmassy. The Winter Wonderland one looks the most exciting for my daughter, very Christmassy. I would love a farm! Wonderland - santa in his car looks great fun! I like the town one. Farmyard as come from a farming background! I would love the Santa Wonderland one. Lovely for little ones. Count me in please. The town Wow toys looks great! The farmyard set because my little granddaughter loves all farm animals, especially cows! Wonderland as it's very seasonal. I would love the farmyard one as both my children r both animal mad. I really like the winter wonderland. This would be amazing for my daughter. The Winter Wonderland looks lovely and festive. Wonderland ~ feel like I want to burst into song! Love the wonderland calendar- it is very CHristmassy! Farm, my little girl loves her farm animals and has just started trying to make all the sounds! This set looks lovely. The 'town' one would be great! The winter wonderland is a perfect countdown to Christmas! I like the Farm Yard one because my little one adores animals and would have so much fun with this. He had a wow toys countdown calendar last year and he still plays with the toys in the bath. I think it would be the Farm as my godchildren all love animals and each one of them has a particular favourite farmyard animal. 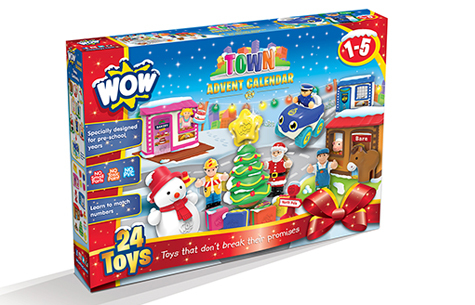 We'd love the Town advent calendar. We love these! The Farmyard one...my son love farm animals!! The Farmyard one as it has an appeal all year round, it won't be put away after Christmas. 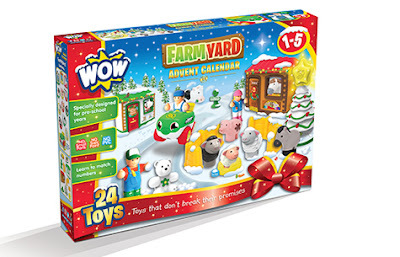 I love the look of The Farmyard Advent Calendar as our little one absolutely loves farms! I love the winter wonderland :) its so CUTE!